The White Rose Country House Hotel, Inn and Restaurant is located at Askrigg in Wensleydale at the heart of Herriot Country and the Yorkshire Dales National Park. The Hotel provides excellent inn accommodation and bed and breakfast accommodation, as well as warm and friendly hospitality. The tastefully designed and equipped traditional Yorkshire bar provides a perfect setting for professionally prepared and cooked light snacks, bar meals... and of course real ales. Lunches and Dinners are served in the new light and airy Orangery with lovely views over the pretty beer garden offers a mouth-watering range of dishes on changing menus. Nearby famous tourist destinations include Aysgarth, Hawes, Leyburn, Masham, Ripon, Richmond and Reeth. This is excellent walking country amidst beautiful scenery and dramatic landforms such as Aysgarth Falls and Hardraw Force. History too abounds with renowned sites including Bolton Castle, Richmond Castle, Fountains Abbey and the Dales Countryside Museum. SPECIAL OFFER - 3 NIGHTS FOR THE PRICE OF 2 MIDWEEK EXCEPT BANK HOLIDAYS - RING FOR DETAILS AND AVAILABILITY. Hazel's Roost is situated in a quiet corner of Bainbridge with private parking for guests. Formerly the Blacksmith's workshop on the ground floor with Cobbler's shop above, this building has been converted into a home offering comfortable accommodation. Ideal base for fishing, walking, touring with spectacular views from every angle.This is a friendly, welcoming comfortable place to stay, offering hearty Dales breakfast of mainly locally produced food. Quiet, comfortable, spacious Edwardian house on the edge of the Yorkshire Dales National Park between Malham, Skipton, Grassington and Settle. Beautiful views in all directions. Excellent for the outdoor enthusiast, close to the Pennine Way. Just 1 mile from the A65. Recently refurbished home with character and charm. Well proportioned rooms: 1 king size with ensuite shower room, 1 double and 1 twin room, house bathroom. Wood burning stove, oil fired AGA cooker, double glazing, central heating, 6MB WiFi broadband, some satellite TV channels. Access to small south facing garden with table and chairs and private parking for 3 cars. There is also a back garden with an unfenced pond and walltop garden levels unfenced in places. Suggest the young children are supervised at all times if you wander through this area. Close to the Coniston Hotel with opportunities for fly fishing, falconry, the Land Road Experience and clay pigeon shooting, restaurants and bars. Evening meals also available in Bell Busk village, Gargrave and Kirkby Malham. 20 minutes drive from Skipton, known as the 'Gateway to the Dales', with its castle, 4 day market, canal, many shops,tea rooms, restaurants and pubs. Easy access by road and rail - Skipton railway station has direct services from London Kings Cross. The local village of Gargrave has a well stocked Co-Op store and an Indian Restaurant. Hellifield, Aireton and Cracoe sell local produce. Settle and Malham are also just 20minutes away. Home to the Bannister family, this Independent 71 bedroomed, family owned Hotel is set in 1400 acres of beautiful Yorkshire Dales countryside - nestled between the market towns of Skipton & Settle. Skipton is home is the famous 4 day market and Castle a perfect all weather attraction. The Hotel is also close to Malhamdale with its limestone pavements, Gordale scar and Malham Tarn, the Settle Carlisle Railway and the Three Peaks. Throughout the hotel you will find a warm and friendly atmosphere with open (log) fires and comfortable lounge areas which offer outstanding Yorkshire Dales views. Macleod's restaurant offers a locally sourced traditional signature menu along with additional � la carte items. The Huntsman's Lodge offers a wide range of drinks and food to suite all tastes : Morning Coffee, Lunch, Afternoon tea and evening snacks. The Coniston Estate is home to a premier CPSA Clay Pigeon Shooting ground, the Land Rover Experience and Falconry Centre, as well as a range of outdoor leisure activities, such as Target Golf, Archery, Mountain Bike hire and Walking Trials. Special breaks include : The Dales Dash, ideal for those with busy lives, looking for a little escape. Prices are for two people sharing a twin or double room. A warm welcome awaits you at The Dalesman Guest House with complimentary tea or coffee on your arrival. The Guest House is located in a tranquil location adjacent to a nature reserve in Embsay, North Yorkshire, on the outskirts of Skipton, within the Yorkshire Dales National Park. Local Embsay Pub, The Elm Tree Inn is a short walk away and offers excellent real ales and good, reasonable food. The Embsay and Bolton Abbey Steam Railway runs regularly from Embsay railway station. Skipton, known as the Gateway to the Dales, offers an award winning high street with market and Leeds Liverpool canal basin, with boat trips available. Skipton's 14th century castle is well worth a visit. Tarrif - Prices are from £30 per person per night. Grassington Lodge is an award winning contemporary guest house, which offers stylish and luxurious accommodation in a quiet setting close to the centre of Grassington, the capital village of Upper Wharfedale. Guests will experience first class hospitality and a friendly service. Lying on the edge of the River Wharfe in the Yorkshire Dales National Park. Grassington is a picturesque village with a cobbled square and quaint streets. The village offers a good mix of interesting shops and restaurants along with several fine old pubs which serve a good selection of Yorkshire brewed ales and excellent food. Grassington Lodge is an ideal base from which to explore the breathtaking and dramatic scenery (featured in the film Calendar Girls) on foot, cycle or by car. Within half an hour lie Harrogate, Ilkley and Haworth's "Bronte Country" with the market town of Skipton just 15 minutes away. Gunnerside, Upper Swaledale - Rowleth End Guest House. Stunning large Victorian semi-detached house built by the Methodist Church in the late 1800's, just two minutes walk from the centre of the beautiful Market Town of Hawes. Ebor House has six magnificent bedrooms (five en-suite) each tastefully decorated and furnished to the highest standards to make your stay truly unforgetable. The location of Ebor House makes it an ideal base for exploring Hawes and the surrounding Dales, the Lake District and the Yorkshire Moors. If you feel the need to escape for a few days this Autumn then look no further than the Stone House Hotel in magnificent Wensleydale. Nestled deep in the heart of the Yorkshire Dales, Stone House offers wonderful food, quality accommodation and a stunning location. 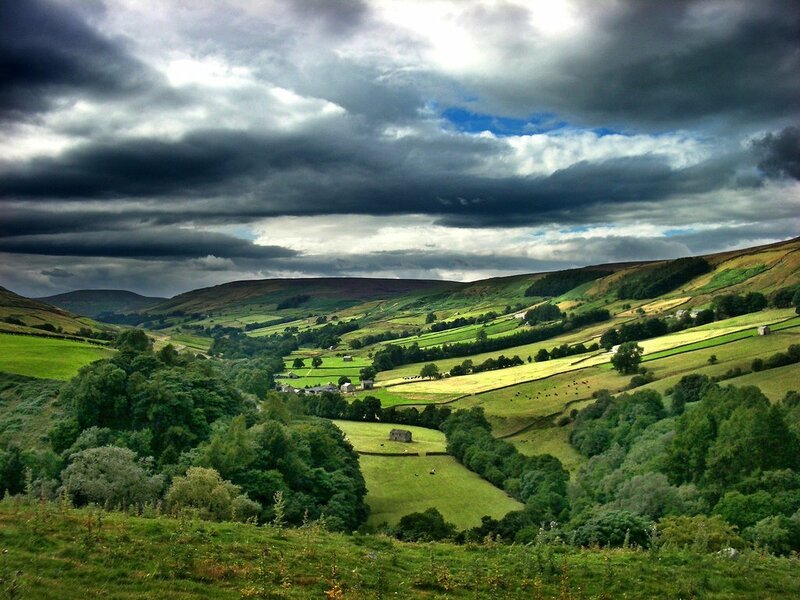 Explore the many dales and villages of Wensleydale, Swaledale and beyond before returning to the delights of the hotel to relax. The special Autumn/Breaks are available from the 1st October with prices starting from £83.25 per person per night for dinner, bed and breakfast. If you need any further encouragement mention "The Yorkshire Times" when booking to receive a complimentary bottle of house wine - Cheers!!" The Stone House Hotel is a classic country house built in 1908 on the sunny side of the valley, near to the charming market town of Hawes in magnificent Wensleydale, in the heart of the Yorkshire Dales. Three of the comfortable bedrooms are four-posters - perfect for a romantic break - and we have five ground-floor Conservatory Bedrooms - very popular with dog-owners and guests with reduced mobility. In the attractive restaurant you can enjoy superb English breakfasts, lunches, afternoon teas, delicious dinners, fine wines and attentive service. A traditional Yorkshire Dales public house with accommodation in the village of Hebden, close to Grassington & Burnsall, in the glorious Yorkshire Dales. Offering two double bedded rooms & one twin room, all ensuite and decorated to a high standard. There is a restaurant seating 22, serving an extensive menu of fresh local produce including game when in season. The Clarendon is the ideal location for walkers, bikers, cyclists & motorists looking for a central location from which to explore the Dales. Summer Offer - 20% off rooms during the week - £48 per room per night, 10% off a two night stay over a weekend - £126.00 for Friday & Saturday. Please quote website offer. Terms & Conditions - Guests taking advantage of this great summer offer must dine in the restaurant or bar area each night they stay. At Holiday Cottages, we specialise in quality holiday lets across Northern England including the beautiful Yorkshire Dales. We have over 70 self-catering cottages across the Dales nestling in picture perfect locations. With over 30 years' experience in the holiday lettings industry, you can be confident you are booking with the local experts! Holidaycottages.co.uk offer a portfolio of over 2,000 individually inspected self-catering cottages across the UK. From romantic retreats to large elegant houses or a home perfect for a family getaway you are sure to find something to suit you. Whether you are looking to bring along pooch or leave him behind we have a selection of dog-friendly properties to choose from as well. Do you want to explore the moors or head to the coast - whatever your ideal holiday is we will have something for you. You can book online through our website or if you want to speak to one of our friendly bookings team we are open from 9am until 9pm and on weekends for your convenience. Home to Chris and Susan Beazley, Langcliffe House is situated in a quiet corner of Kettlewell and enjoys stunning views down Upper Wharfedale. Guests are accommodated in two double bedded rooms with en suite showers. Bedlinen is crisp white Egyptian cotton, pillows and duvets are hypoallergenic. Fluffy towels and dressing gowns are provided with complimentary toiletries. The clean, colourful rooms have free WiFi, TV, comfy tub chairs, tea and coffee making facilities and a hairdryer. A delicious breakfast is served in the Dining Room from 8am-9am each morning. The conservatory is available for guests and on warm, sunny days you can enjoy our large productive garden. A gallery with Susan's paintings and ceramics has seating, books and magazines, maps and local information plus DVDs and games to borrow. Kettlewell, in the heart of Upper Wharfedale and the Yorkshire Dales National Park, is a marvellous base from which to explore this internationally renowned area. The Dales Way footpath and the Dales Cycleway pass through the village. Sunday to Thursday nights only. Why not take advantage of our offer of 4 nights for the price of 3? If you stay for three consecutive nights you get a 4th night free. You could have 4 nights' bed & breakfast for only £255, that is per room NOT per person!! Offer available between Sunday 3rd November 2013 and Thursday 27th March 2014. A friendly atmosphere awaits you in our comfortable home conveniently situated a few minutes walk from all the amenities of Leyburn Market Place. All bedrooms are en-suite with lovely views across the Wensleydale countryside. Greenhills is a non smoking establishment with off-road parking and a lock-up garage for bikes. All bedrooms are en-suite with bath and shower over, remote controlled flat screen colour TV (Freeview), hairdryer, clock/radio, tea and coffee making facilities and lovely views across the Wensleydale countryside. In the Yorkshire Dales National Park, near Askrigg in the heart of Wensleydale and ideally situated as a base to explore Yorkshire and The Lake District. The accent is on quality and the standards of comfort and service ensure a really comfortable stay in either the B&B or self catering. Tucked away in a quiet corner of the tiny hamlet of Worton, Stoney End Bed & Breakfast offers three bedrooms, all furnished, decorated and appointed with your comfort in mind. Stay more than one night and try a half price session in the luxury infrared sauna. Work out in the new mini gym and for guests who need to keep in touch there is free wifi. Yoredale the groundfloor room has a small outside seating area and a Hot Tub with views over Wensleydale. Away form the bustle of modern life, Stoney End Holiday Cottage is in a secluded quiet corner of Worton; it has a Hot Tub on the Patio overlooking Wensleydale and free wifi. Pets welcome by arrangement. For further details and more special breaks, please see the website. Laykin Cottage is just one of the luxury Yorkshire Cottages available from Gorgeous Cottages. An exceptional luxury cottage enjoying an elevated position on a hillside, the views of Swaledale below are breath-taking. It's a truly fabulous family-friendly holiday home. Inside you'll find a super-large open plan kitchen/dining room complete with (heated) stone flooring, Rayburn stove, breakfast bar and farmhouse-style dining table. The lounge features a wood burning stove, leather sofas, LCD TV with DVD Player/Free View. There is also a boot/drying room downstairs and a further utility with shower and WC . Upstairs there are two king-size double rooms, a twin room and a very generous single. There are also two further family bathrooms upstairs with baths and showers. Outside, there is a charming raised lawn area to the side of the cottage with further gardens and a patio, complete with BBQ and patio furniture. Dating from 1680, the Black Bull is Reeth's oldest surviving Inn. Overlooking the village's expansive green, this old hostelry provides quality accommodation and a wide variety of foods ranging from bar snacks and our popular Carvery to table d'h�te and an � la Carte menu in our intimate restaurant. A fine selection of real ales and quality wines are offered in the traditional bar whilst regular live music and special events contribute to the special atmosphere that attracts locals and visitors alike. Accommodation can be found in one of the well appointed en-suite rooms, most with stunning views of Reeth and Swaledale. The Black Bull is a perfect base for your walking holiday, situated on the Coast to Coast footpath, the Inn Way and within easy driving distance of both the Lake District and the North Yorkshire Moors. available every Sunday from 12.00pm 'till 2.30pm. Featuring local butchered and prepared roasts, seasonal vegetables and a selection of roast, boiled, mashed and new potatoes, Yorkshire pudding and incredible gravy to top it all off with. A selection of starters and sweets are always available to compliment your Carvery selection. Mouth-watering! Natural Retreats Yorkshire Dales is set within a delightful location amongst the beautiful countryside of the Yorkshire Dales National Park and is just a short walk along the Coast to Coast footpath from the town of Richmond. Having undergone a complete refurbishment all the award-winning lodges are splendidly decorated to a high standard and the outside areas have been enhanced with fabulous landscaping. The lodges at Natural Retreats comprise a contemporary open plan living area complete with flat screen TV, DVD player, a wood burning fire and a stunning expanse of glass displaying superb views of the countryside. There's also a fully fitted kitchen complete with everything you may need whilst you're away. The lodges come in two different styles but they all have three double bedrooms and can accommodate up to six adults. Whilst holidaying at Natural Retreats Yorkshire Dales there are plenty of activities to keep you and your family entertained. Why not hire mountain bikes to take advantage of this spectacular location, explore the delightful hidden footpaths across the Dales or take some time to sit and relax whilst fishing on the River Swale?�Natural Retreats' unique Concierge Team can help with planning your perfect day out. Set in the heart of the beautiful Yorkshire Dales, the fine Edwardian residence of Mainsfield stands proudly overlooking the charming town of Settle, with its breaktaking hills and one of the Three Peaks of Pen-y-ghent as the backdrop. Visitors will be charmed by its spaciousness and attention to detail, from the entrance hall with its oak panelling and snooker/pool table, to the residents drawing room with its cosy open fire and comfortable surroundings, making it the perfect place to relax and unwind after taking in some of the many sights of the local area. The bedrooms at the front of the house have some fantastic views looking out across the hills. Some of the rooms have king size four poster beds and most have en-suite facilities. As well as remote controlled colour TV there are also tea/coffee making facilities found in every room. Breakfast is traditional with fresh coffee and Yorkshire tea. All our food is fresh local produce with a choice of full English breakfast or lighter alternatives. Vegetarian or special diets are also catered for. The lovely breakfast room was once the music room of the original owners the Best family, where the famed Edward Elgar, often played music with his friends. There are a number of good pubs and restaurants locally. Settle town centre is just a short walk over the nearby bridge from the house and has a lot to offer visitors. Our B&B has a warm and friendly atmosphere, and we always try our best to make all our guests feel at home. We use Fair Trade or locally-sourced food and products whenever possible. We can provide packed-lunches on request and we will always do our utmost to cater for special dietary requirements (please advise us of your requirements when making a reservation). We have secure covered storage for bicycles and are pet friendly. Bikers are welcome. Choose from a fantastic selection of holiday cottages throughout Yorkshire from the UK's leading holiday cottage agency, Sykes Cottages. We have self-catering accommodation ideal for any Yorkshire holiday from cosy cottages with an open fire to contemporary barn conversion with a touch of luxury. Many of our cottages are pet friendly and offer great value short breaks throughout the year. Visit our website to browse all of our Yorkshire cottages, check availability and read reviews from previous guests via TripAdvisor. Our team of holiday cottage advisors are also waiting to take your call until 9.30pm, seven days a week. Start planning your trip to Yorkshire with Sykes Cottages today! You and your pets will be warmly welcomed at Wensley House, the home of Linda and Brian Maloney. Their B&B offers you style and comfort with spacious en-suite bedrooms, a delightful dining room and traditional guest lounge. Set in beautiful Wensley Park, the house has breath-taking views over meadows, grass fields, woods, the river Ure and Penn Hill. There are loads of wonderful walks for all levels of enthusiasm. Setting off from Wensley House, you can walk to the market towns of Leyburn or Middleham or the typically English village of Redmire.. All the local towns and villages offer a great choice of pubs and restaurants for relaxing and resting on your travels. Rooms are spacious en-suite twin or double bedrooms, tastefully furnished and complete with remote controlled TV's, hair dryers and tea/coffee/hot chocolate making facilities. Continental or Full English Breakfasts are included in your stay, and by prior arrangement as an extra, two or three course home-cooked evening meals can be prepared by your host and acclaimed chef Brian Maloney.